It was initially a Christmas-themed parade when it debuted in 1924. Some 10,000 people watched Santa riding on a float designed to look like a sled being pulled by reindeer. The initial parade was such a success that they decided to make it an annual event. 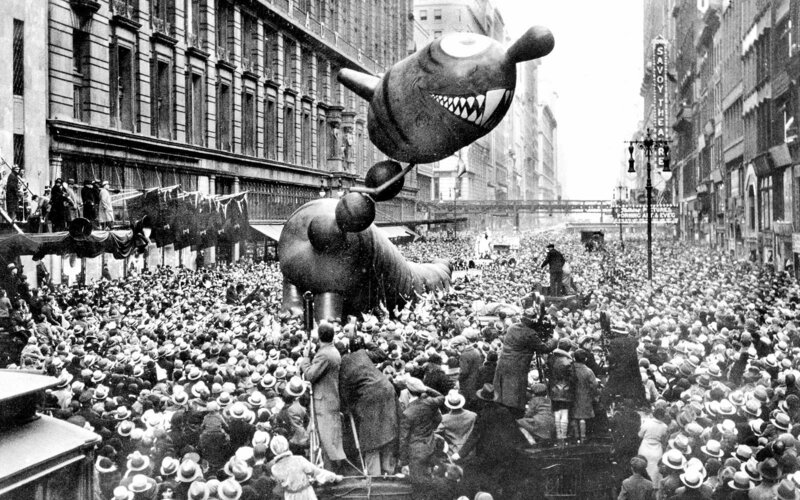 It became the Thanksgiving Day Parade in 1927. Parades from 1924-1926 featured monkeys, bears, camels, and elephants. These were all borrowed from the Central Park Zoo. The animals were replaced in in 1927 by inflatable critters. This was the first year that the parade’s signature giant helium balloons made their debut. Felix the Cat lead the way. He was joined by a flying dragon, elephant, and toy soldier. Large balloons take about 12,000 cubic feet of helium to become fully inflated. Macy’s is the second largest consumer of helium, behind the U.S. government. The parade was canceled during World War II. The store put the balloons to good use and donated a total of 650 pounds of rubber to the U.S. government for use in the war effort. Snoopy has appeared more than any other character. Snoopy made his debut in 1968 and has been in the parade a total of 39 times. Up to 90 people are needed to anchor and navigate each balloon, using long ropes affixed to the bottom and sides of the balloons. The balloons are not cheap. It costs about $190,000 to build a balloon, and it costs about $90,000 a year to show them after that.